We would like to inform you how we use and store potential customers and customers personal data. Your name, address and telephone number given to us by yourself or your representative are used soley for providing you with information about our service and arranging a demonstration at your request and subsequently sending paper if you become a customer. We do not share your personal data with any 3rd party unles you request us to or we are required to do so by law. This entry was posted on Wednesday, May 23rd, 2018 at 10:57 am	and is filed under GDPR. You can follow any responses to this entry through the RSS 2.0 feed. Both comments and pings are currently closed. We at Independent Vision always try to keep up with new technology and equipment as it becomes available. We regularly speak with the importers and manufacturers of Electronic Magnification equipment, as well as attending Exhibitions and Seminars. Our role is to find solutions to some of the difficulties that visually impaired individuals face. Of course we can't supply every machine, but we do pride ourselves on our ability to find the compromise between the best machine at the most efficient price. In 2018 we attended Sight Village in Birmingham to assess the latest new technology, equipment and products. 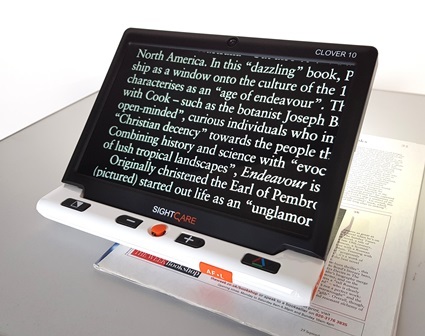 In November 2018 we took delivery of a Clover 10", a hand held portable magnifier similar in size to a tablet; with its own carrying case, it's a great way to bridge the gap between portable and desk top machines. Please contact us for further information.